I know that by now in the series, I’ve already made Ginger Snaps and Gingerbread.You’re probably wondering: Jess, is it really necessary to throw in one more ‘ginger’ themed recipe? Answer being….yes. Because you can never have too much ginger-stuff- especially not at Christmas. 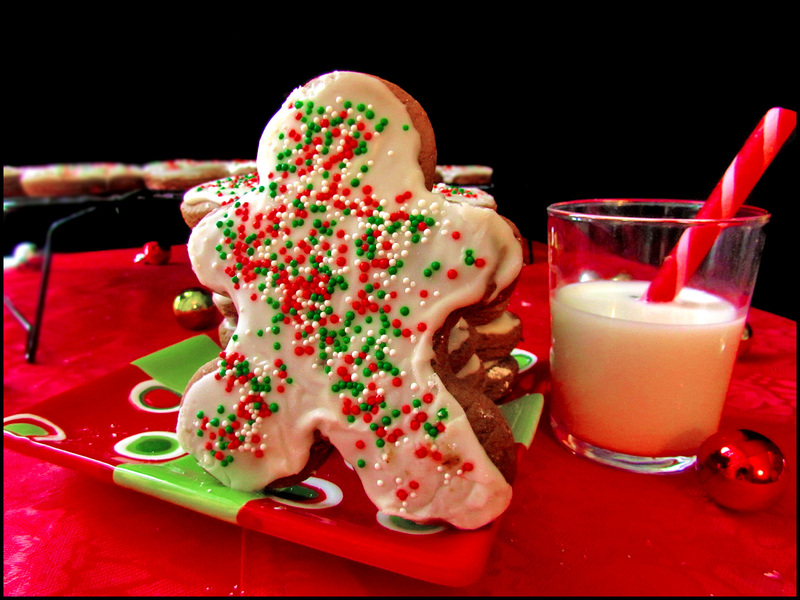 And especially not when it comes to these gingerbread men cookies. Whereas Gingersnaps are traditionally either really chewy or crunchy and Gingerbread is fluffy and almost cake-like, these Gingerbread men meet somewhere in the middle of those two. Of all three ginger recipes that I’ve made this year, I’ve gotta say that these are without a doubt, my favorite. They really puff up in the oven, so they’re thick and sturdy enough for decorating. Best of all, as long as you don’t over bake them, the dough stays soft and tender for days (which is how I prefer to eat them). As you can see, I chose to decorate my gingerbread men with my standard favorite toppings: an icing made with powdered sugar, milk and vanilla extract with sprinkles on top. However, if you have small children at home, feel free to use whatever else you like. I found this recipe at browneyedbaker.com and have been using it for the past couple of years or so. It’s easy to follow and makes quite a few cookies to share…or keep all to yourself. Your choice. Today’s Christmas recommendation is actually for a short story by Truman Capote called “A Christmas Memory”. I first read it many years ago in school (I don’t remember how old I was), but I do remember that it made an impression on me, and that I liked it very much. It’s about a young boy named Buddy that recalls a memory he has from his childhood of baking Christmas fruitcakes with one of his distant relatives who is slightly mentally retarded. It’s simple, but very sweet and even somewhat sad at the end. I like to read it not only because Truman Capote is a gifted writer, but because there’s a kind of Christmas nostalgia in the language of the story that I just love. I’ve included a link to an online version of it in the picture, so if you would like to read it (and I highly recommend that you do). 3/4 cup (6 ounces) unsalted butter, cut into 12 pieces and softened slightly. 3. Preheat oven to 350 degrees F. Line two cookie sheets with parchment paper. 4. Remove one dough sheet from freezer; place on work surface. Peel off top parchment sheet and lay it back in place. Flip dough over; peel off and discard second parchment layer. 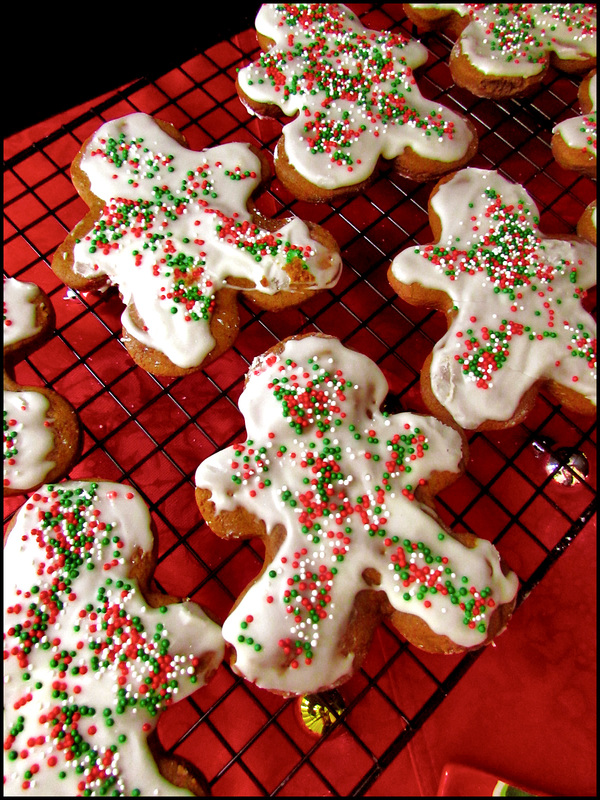 Cut dough into gingerbread people or round cookies, transferring shapes to parchment-line cookie sheets with a wide metal spatula, spacing them ¾-inch apart. Repeat with remaining dough until cookie sheets are full. Bake cookies until set in centers and dough barely retains imprint when touched very gently with fingertip, 8 to 11 minutes, rotating cookie sheet from front to back halfway through baking time. Do not overbake. Cool cookies on sheets 2 minutes, then remove with wide metal spatula to wire rack; cool to room temperature. 5. Gather scraps; repeat rolling, cutting and baking in steps 2 and 4. Repeat with remaining dough until all dough is used. 6. Once cookies are cool, decorate with royal icing, if desired. Store in an airtight container at room temperature for up to 1 week. 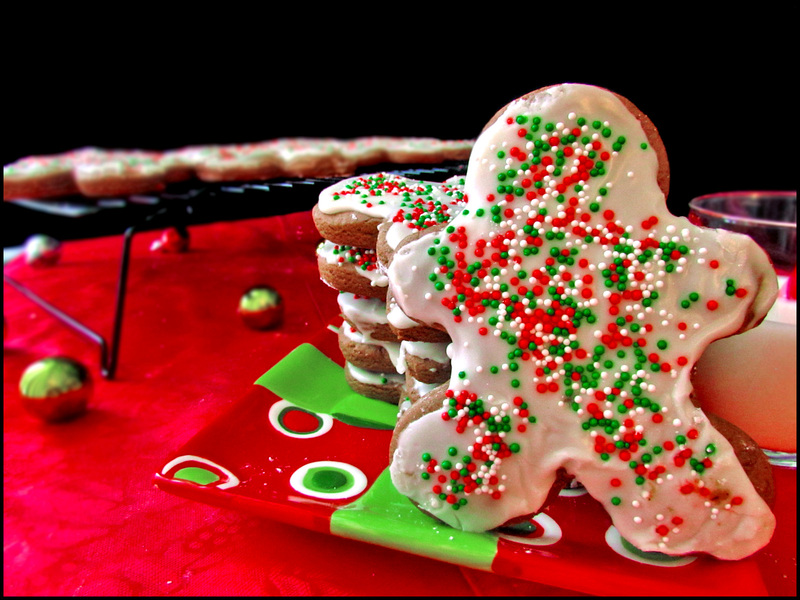 Thank you for linking to my “Thoughts on Socks – Cheery Gingerbread Men” post. I love gingerbread in any form! These gingerbread men look amazing! I love the festive colors. Happy Holidays!